Rabies, an invariably fatal disease, has been known and feared since antiquity and is usually caused by the bite of an infected animal. More than 98% of all human rabies deaths are caused by the bite(s) of rabid dogs. Rabies is distributed worldwide and can affect all mammals including humans. The virus responsible for rabies infects the central nervous system resulting in a neurological disorder characterized by horrific clinical signs and symptoms in both animals and humans. Prevention of rabies in humans is complicated because those most commonly exposed to canine rabies (e.g., children, the poor) also lack the resources necessary to treat or prevent exposure. This means that governments, and other organizations are often the primary source of funding for the required post exposure prophylaxis (PEP). In several countries, such as Ethiopia and Kazakhstan, studies have calculated major economic losses due to rabies deaths amongst lifestock (see here) and total lifestock losses globally are estimated to be over $500 million per year (see Hampson et al. study here ). Rabies also threatens the survival of endangered wildlife species, such as African wild dogs and the Ethiopian wolf. Controlling rabies is critically important to prevent human deaths and alleviate its burden in animal species and on local and national economies. Evidence that canine rabies elimination is feasible, primarily through mass dog vaccination, has been increasing over the last decades (see here), and in 2015, a “Rationale for investing in the global elimination of dog-mediated human rabies” was jointly released by WHO, OIE and FAO. 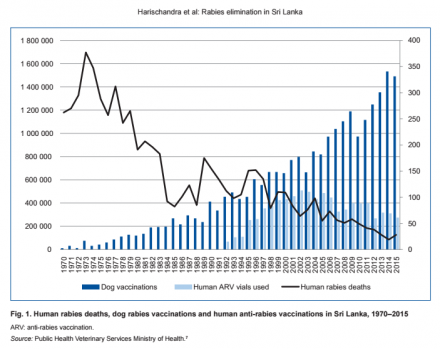 In Sri Lanka, mass dog vaccinations have dramatically reduced human rabies cases, and human vaccine use has fallen. In December 2015, delegates at a global meeting entitled “Global elimination of dog-mediated human rabies: The time is now!” agreed on a strategic vision of an end to human deaths from rabies by 2030. Following discussions at that meeting, a Global strategic framework for the elimination of dog-mediated human rabies was released in March 2016. These global efforts are supported by the End Rabies Now campaign. Read here for more information on rabies and here for updates about international efforts to support global canine rabies elimination. previous page: 1.3. How does it work and what does it include? next page: 1.5. Why is it possible to control canine rabies?